In this twenty-seventh archive story by Kristian Bertel, we are photowalking in Delhi, India to the Naya Bazar Rd meeting a messed up Indian man. Read the background story of this archive photo by the photographer. Let your photos reflect who you are and what type of photography you are passionate about. Cameras are everwhere, but carrying around a giant camera bag tends to scare people when doing street photograph. 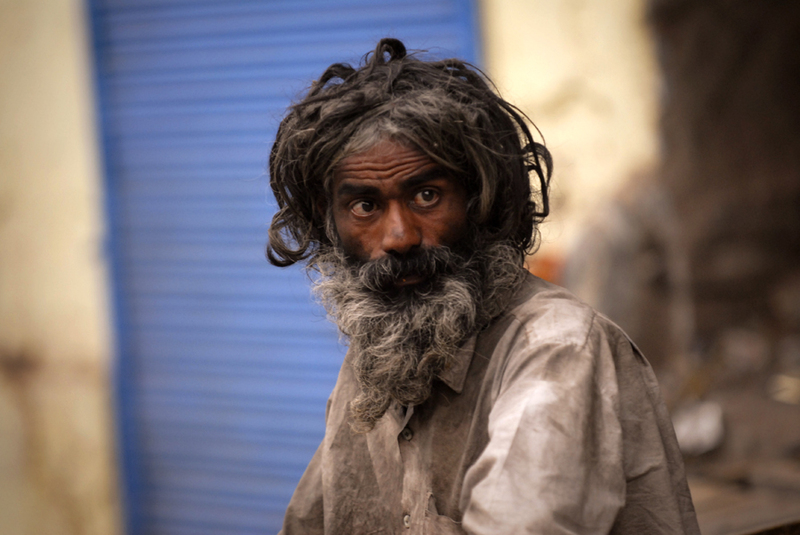 In this photo the photographer likes the rustic locations of his subjects and the portrait was taken during a photowalk and depicts an Indian man at the Naya Bazar Rd in Delhi, India. Getting around Delhi is always an adventure. Traffic is, by and large, horribly congested and many drivers will think nothing of quoting ten times the going price to a tourist. Best way to travel is via metro, where there are separate cabins for women that prove to be very useful during rush hour. Or by foot like the photographer did in Naya Bazar Rd. Delhi is known as a microcosm of India and is a leading world city with strengths in arts, commerce, education, entertainment, fashion, finance, healthcare, media, professional services, research and development, tourism and transport all contributing to its prominence. It forms the National Capital Territory of Delhi, rather than being part of a state. India's capital and the home of the executive, legislative, and judiciary branches of government. Like the rest of the Gangetic Plains, Delhi is as flat as a pancake. The only geographical features of any significance are the river Yamuna, which flows down the eastern side of the city, and the Aravalli Hills which form a wide but low arc across the west. On the west bank is the crowded and congested Old, Central, Delhi and, to the southwest, the broad, tree-lined avenues of New Delhi, built by the British to rule their empire. The rest is an endless low-rise sprawl of suburbia and slums, with southwestern Delhi nearer to New Delhi generally somewhat wealthier. The native language of the Delhi area is Hindi, which also happens to be the main official language of the Union Government. Hindi is spoken by almost all locals, quite often with Bihari and Punjabi accents. Most educated people are also fluent in English, and many shopkeepers and taxi drivers have a functional command of English. Punjabi and Urdu are also official languages, but are not as widely spoken. The Hindi spoken in Delhi is quite Persianized, similar to the Hindi spoken in Western Uttar Pradesh and much less Sanskritized than the Hindi spoken in Madhya Pradesh. Signage is usually bilingual in Hindi and English, and some road signs especially in South and Central Delhi are in Hindi, English, Punjabi and Urdu. Announcements on the metro are in Hindi male voice and English female voice. People from all over India are found in Delhi, but finding a person who can speak other Indian languages is not so easy. Metro is clean, efficient, and typically ridden by relatively affluent middle-class students or commuters en route to and from work, there is almost nowhere in the city that you cannot get to by metro. Much of Delhi is quite pedestrian-hostile. Distances are long, road signage is poor, and in the more tourist oriented areas, you'll be constantly accosted by beggars and touts. Crossing roads often involves wading across multiple lanes of heavy traffic. Try your best to move in a predictable straight line, so vehicles can weave around you. Better yet, latch onto a group of locals and cross in their shadow. As a photographer and traveler in India it is a good thing to photograph the contrasts with clothing and location. "- I recently shot photos of Indian people who chose to wear bright colors. Those colors undoubtedly catch the viewer's attention, so I chose to place them in front of muted backgrounds. For this shot, I chose old grey brick walls, blurred out dark backgrounds and so on. You can also apply this tip when shooting a subject who is wearing muted colors. In this situation, shoot the subject with your cameramodel against a brightly colored background to make the person stand out", the photographer says and he continues:"- Be yourself and shoot what you love. I think it is unfortunate when photographers do downright strange things to try and make a creative portrait. Do things that you like. If you are more of a serious type, then shooting traditional portraits in a studio is probably what you will do best. If you are more fun and flirty, then shooting models in an ice cream shop or jumping on a trampoline will probably produce your best work. When I shoot portraits for clients, to take couples who are dressed nicely into old rustic city locations, and when the subject is dressed casually, I like to take the subject into a more formal location like a church or garden. The contrast makes for interesting portraits", the photographer says. India is a land full of stories. On every street, on every corner and in the many places in India, life is rushing by you as a photographer with millions of stories to be told. In the archive story above, you hopefully had a readable insight in the story that was behind the photo of a messed up Indian man in Delhi. On this website of Kristian Bertel | Photography you can find numerous travel pictures from the photographer. Stories and moments that tell the travel stories of how the photographer captured the specific scene that you see in the picture. The photographer's images have a story behind them, images that all are taken from around India throughout his photo journeys. The archive stories delve into Kristian's personal archive to reveal never-before-seen, including portraits and landscapes beautifully produced snapshots from various travel assignments. The archive is so-far organized into photo stories, this one included, each brought to life by narrative text and full-color photos. Together, these fascinating stories tell a story about the life in India. India, the motherland to many people around the world, a land of unforgetable travel moments. The archive takes viewers on a spectacular visual journey through some of the most stunning photographs to be found in the photographer's archive collection. The photographer culled the images to reflect the many variations on the universal theme of beauty and everyday life in India. By adding these back stories the photographer's work might immensely enhanced the understanding of the photographs.